AUGUSTA, Ga. -- As he entered the tee box on No. 18, the roars began, reached a crescendo as he approached the green and shook the pristine Augusta National course once he drained his final putt and spectators raucously chanted his name. Tiger Woods has done it again. Woods is a Masters champion for the fifth time in his illustrious, storied career. After an 11-year drought, golf's most polarizing and popular figure has added another major to his dossier, outlasting a star-studded leaderboard on Sunday by posting a final round 2-under 70 to win the 2019 Masters. It's his first major win since the 2008 U.S. Open, 15th of his career and first at Augusta National since 2005. With five green jackets now in his Augusta locker, Woods is second all-time at the pristine course behind only Jack Nicklaus, who won six times between 1963 and 1986. Woods began the day T2 and in the final pairing for the first time since 2007, but he sat two strokes off leader Francesco Molinari, who had been steady all week. Molinari led throughout much of the day, in fact, until double-bogeys on No. 12 and No. 15 opened a small window for Tiger to pounce -- and pounce he did. Woods birdied the par-5 13th hole and par-5 15th for the third time this week, then birdied the par-3 16th with a near-hole-in-one. He walked up to No. 17 with a two-stroke lead on Dustin Johnson and Brooks Koepka, and when Koepka missed a birdie putt on 18 that would have put pressure on Woods, Tiger was able to clinch it with a bogey on the final hole. "I was just trying to plod my way around the golf course all day, then all of a sudden I had the lead, and coming up 18, it was just trying to make a 5," said Woods. "When I tapped the putt in, I don't know what I did, but I know I screamed. And then I was just looking for Joey. I shook the guys' hands and then found Joey, and it was a pretty big embrace. To have my kids there, it's come full circle. My dad was here in 1997 and now i'm the dad with two kids there." Woods becomes a five-time Masters winner on Sunday, which stands alone as the second-most in the sport's history ahead of Arnold Palmer. Only Jack Nicklaus, who won six, has more. The victory marks Woods' first at Augusta since 2005, when he capped an incredible decade of dominance at the event he also won in 1997, 2000 and 2001. "It's overwhelming," said Woods of winning for a fifth time. "I think just because of what has transpired, and last year i was just very lucky to be playing again. The previous dinner, the champions dinner, I was really struggling and missed a couple years of not playing this great tournament. To now be the champion, 22 years between wins is a long time. But it's just unreal for me to experience this. My mom was here, she was there in 97 as well. So I just couldn't be more happy and more excited and i'm kind of at a loss for words, really." Woods' fourth and final round was a roller coaster, much like the rest of the field. He began with consecutive pars before birdie-bogey-bogey on 3, 4 and 5. In his final four holes on the first nine, he tapped in two birdies to stay on pace with the leaders. His second nine was bookended by bogeys, but in between, he played the seven holes at 3-under, led by consecutive birdies on 15 and 16. 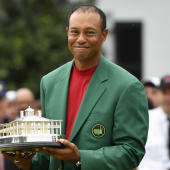 Following the victory, Woods made an appearance in Butler Cabin to receive his fifth green jacket from 2018 champion Patrick Reed. Sliding on the jacket, a wry smile crept across his face. CBS Sports was with you the entire way on Sunday for every hole of Tiger's incredible Masters win, updating this story with highlights throughout. If you are unable to view the live updates below, please click here.